The Landforce Duo 235 combination wood chipper and green waste shredder in action, making short work of whatever is thrown at it! The Hardmet Landforce Duo combination chipper shredders are priced to compete with dedicated single use machines. 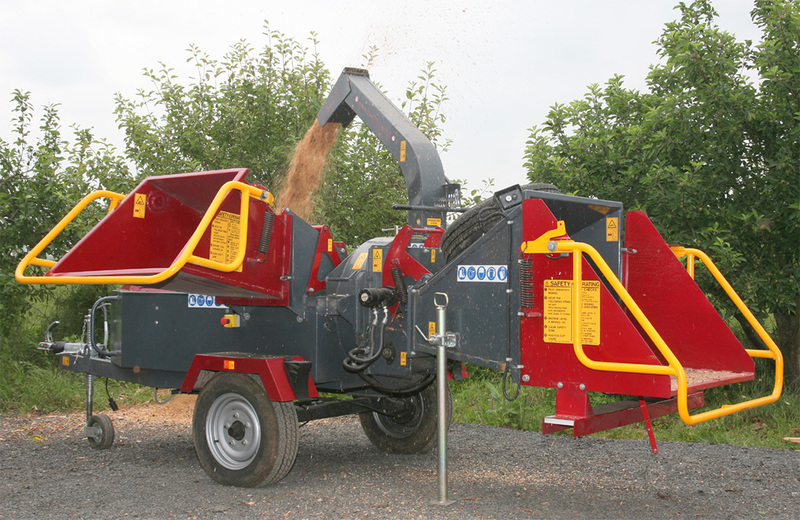 If you're an arboriculturalist, tree surgeon, contractor or hire company, a Duo chipper/shredder is the machine for you, offering flexibility where it's needed. These are very rugged dual-purpose machines that deal with everything from large branches to light brush. With the shredder, brash and waste materials are processed to form materials for mulch, compost or recycling for on-site use. Chippings from the chipper can be used as mulch or to reduce material volume for off-site disposal. The Hardmet Landforce Duo 235 machine - British built and a bit of a brute, with a 61hp Deutz diesel. It almost has too much power - not a bad fault! This is a combined chipper and shredder designed to cope with everything you are likely to meet on site. It's a solidly-built machine and will last for years. 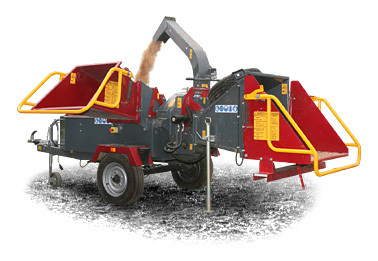 You can feed the chipper and the shredder at the same time for maximum time efficiency. Push the sweepings and other detritus through the shredder to get your crews away as effectively as possible at the end of the day. The shredder element of the Duo machines is a helical flight design, combining low power consumption with aggressive action. Designed for lower noise operation, both the chipper and shredder lacerate the incoming material to reduce volume and promote rapid decomposition. The flywheel chipper on all models is fed via hydraulic powered rollers that automatically cut the feed to the chipper when the engine speed drops below a preset limit, reducing the chance of blockages. Click here to request more information on the Duo range. The Duo range comprises two models with a 200mm and 235mm chipper capability. All models have an integral shredder which will accommodate material up to 50mm in diameter. On the Duo 200, the 200mm (8") capacity chipper gives this machine the power to handle larger tasks, making it the perfect option for Grounds Maintenance/Landscaping businesses. After some experimentation with lightweight plastic diesel tanks (which are standard in the construction equipment industry), we decided to build our machines with steel fuel tanks, as the weight saving was marginal. The transit securing system, to eliminate rattle on the safety bars and reduce microswitch damage, is available as standard. We use only the larger, oversized jockey wheels on the equipment as it eases manhandling and manoeuvering. For added piece of mind all Landforce equipment comes with lockable bonnets as standard. Tracker and other marking options are available on request. All new machines have additional bearings and strengthened support for the feed rollers. Field upgrades to ealier models are available - please call for details and costs. For added stability, particularly when the machine is not connected to your truck or towing vehicle. All machines have a stabilising leg fitted as standard. For older models they are available as a self-fit upgrade (POA). All Landforce machines have twin hydraulic feed rollers for the chippers. Our trochoidal shaped cutters have the ability to index 3 times for efficiency. For additional ease of use twin operating control boxes can be fitted as an option (POA). Chippings can be put were you want them with the 360° rotating chute. At the end of the day, the loading chutes fold simply and securely into place, so you're ready for travelling with the minimum of fuss. All Landforce machines are supplied with a spare wheel as standard.